Hironori Otsuka, a wiry, white-haired master, drops of sweat glistening across his brow and up the crown of his bald spot, led 40 young karate stalwarts in stabbing, punching and kicking their way through the paces of a wado-kai kata. During a brief rest period, a friend approached the master and handed him a large, elaborately wrapped gift. “For your 80th birthday,” he explained. Still lean and hard at “only 79”, Hironori Otsuka is a robust example of how the martial arts can give a man a long, healthy life. Hironori Otsuka is the founder and honorary president of the Wado School of Karate. He is also vice chairman of the All-Japan Karate Federation and director of the Japan Classical Martial Arts Promotion Society. In 1966, the government honored him with the fifth Order of Merit (the Cordon of the Rising Son) for his contributions to karate. The story of how this remarkable man created a new style of karate from a unique blend of atemi-style kempo, jujitsu and the Funakoshi brand of karate goes all the way back to 1892. Hironori Otsuka was the second child of four children. His father, Dr. Tokujiro Otsuka, operated a clinic at their home in Shimodate, lbaraki Prefecture. His mother’s uncle, Chojiro Ebashi, was a is samurai warrior who kept young Otsuka spellbound with h s true tales of exciting samurai adventures. In 1898, when he was only six years old, Hironori Otsuka began practicing jujitsu under the tutelage of his father. By 13, he was a young shave-tail in the Shintoyoshin School of Jujitsu, where, along with 35 other young students, he studied under Yukiyoshi Tatsusaburo Nakayama. Whereas most jujitsu schools specialized in throwing and ground or striking techniques, the Shinto-yoshiryu stressed atemi–striking and kicking. In the spring of 1911, when Hironori Otsuka was 19, he entered Waseda-one of Japan’s finest universities. While majoring in business administration, Otsuka also started training in atemi-style kempo and continued his practice in Shinto-yoshin-ryu and other jujitsu schools. The death of Otsuka’s father in 1913 during his junior year at Waseda forced him to withdraw and to go to work in a bank in Shimodate. And as it turned out, he was never able to return to complete his final year and graduate. Eight years later, on June 1, 1921, Hironori Otsuka celebrated his 29th birthday by taking over the mastership of the Shinto-yoshin-ryu from Katsusaburo Nakayama upon receipt of a certificate of “full proficiency” in the jujitsu school. The next year, an article in a newspaper reporting on Crown Prince Hirohito’s visit to Europe was destined to profoundly affect Otsuka’s life and provide a new direction in his martial arts career. The story said that the Crown Prince had also visited Okinawa, where he was entertained with a dancing performance and a demonstration of karate. It added that an Okinawan named Gichin Funakoshi had arrived in Japan and was planning to demonstrate the local martial art at a public hall in Tokyo. The 30-year-old bank clerk promptly packed himself off to Tokyo to take a first-hand look at what this Okinawan master had to offer. He wound up at Meishojuku, the gymnasium where Funakoshi was training some students in karate, and wasted no time introducing himself to the diminutive martial arts master. “Funakoshi-san welcomed me,” Otsuka recalls, “and said he would gladly teach me karate. “Although most Okinawans appear to be naturally suspicious,” Otsuka added, “he was surprisingly open and frank-even innocent.” From then on, Otsuka practiced karate virtually every night at Meishojuku. And from the first introduction to the Okinawan martial art, ideas started whirling through his head about adapting the atemi techniques he had learned in jujitsu to karate. After the great earthquake of 1923, jujitsu rapidly faded in popularity, overshadowed by judo and the newly-imported karate. Accordingly, Hironori Otsuka turned his attention more and more to karate. 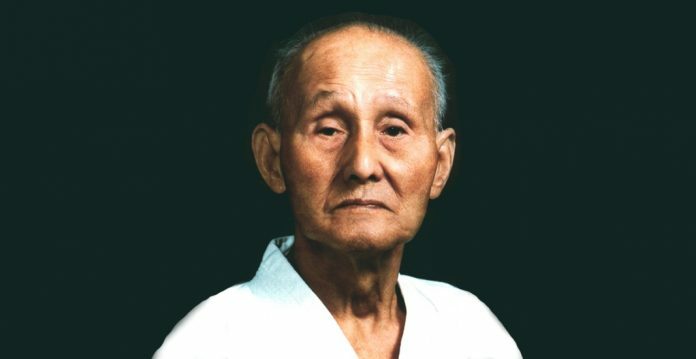 Continuing his close association with Funakoshi, Otsuka remembers that the karate master often relied on him to organize things and assist in instructing karate students. In 1927, Hironori Otsuka quit working at the bank and set himself up as a medical specialist in the treatment of persons injured in the martial arts. 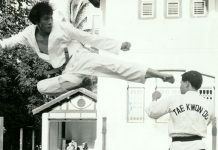 He continued his training in karate, and two years later he organized the first school karate club at Tokyo University. But more importantly, in 1929 he launched a study into a method of arranging kumite (free-style fighting) into competitive matches, laying the basis for present-day kumite-style tournaments. 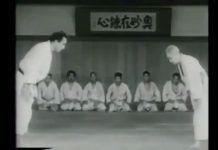 Even back then, Otsuka stressed kumite over kata, in sharp contrast to Funakoshi’s teaching methods. After 1930, Hironori Otsuka went increasingly on his own, setting up a string of karate clubs at various universities in Tokyo in the manner of Funakoshi. Besides Todai (Tokyo University), they included Rikkyo and Nihon Universities as well as Tokyo Dental College. The big day in Otsuka’s life finally arrived in the fall of 1934 when he officially inaugurated his own unique style of karate. He called his new school the Karate Promotion Club. But it wasn’t until 1940, when the Butokukai requested each of its member groups to submit the name of its founder and the official name of the style or school, that Otsuka finally devised the present name-wado-kai, or the way of harmony. Hironori Otsuka has built his wado style of karate around nine basic kata, five of which are regarded as the fundamental techniques. 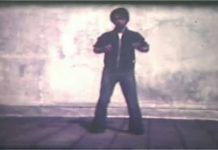 The basic stances are called taisabaki. 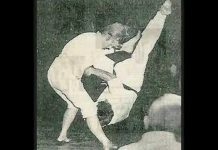 The atemi techniques of jujitsu have had a strong influence in the formation of wado-kai karate. Otsuka also has incorporated the nage-waza (throwing techniques) of jujitsu into his blended style of karate. As developed by Hironori Otsuka, wado-kai karate consists of two practice styles: ma, the proper distance from one’s opponent; and kiai, timing, or finding the best chance to attack. Attacking is also considered defense, since offense and defense are part of the same movement. A blocking movement is often transformed into an attacking movement in what amounts to one continuous motion. In other words, the arm used to block an opponent’s thrust is immediately redirected toward the opponent’s body as a counter thrust. Another feature of wado-kai is its flexibility. When one kind of attack is blocked or stymied, a wado-kai man will instantly shift to another type of attack aimed at different parts of his opponent’s body. He also tends to feint against one part in order to effectively attack another part. Thrusts are not always delivered along a level plane, but can also be directed from a low stance along an upward plane to the body or from a high stance downward. Moreover, attacks are variously made, from orthodox punches and kicks to knife-edge slashes, knuckle jabs and palm thrusts against the chin. During a recent instruction session at Tokyo Dental College, Hironori Otsuka gave a few demonstrations of his taisabaki stances and wado-kai techniques, using his son Jiro as the attacker. To defend against a thrust or punch aimed at his midsection, he would wait until the very last instant before impact and then swiftly twist his body to avert the blow. In a similar attack, he blocked the thrust with his right forearm, countered with a punch with his left and followed through with a knife-edge strike against the left side of the neck. Besides body-twisting, his taisabaki movements included ducking under a thrust or abruptly leaning back to avoid a punch. When attacked by a kick, he countered simultaneously by knifing in to one side of the kick with a thrust. Another time he quickly closed in to one side of his rival and threw him off-balance by forcing him backwards with a timely push. During the war, Hironori Otsuka continued instructing students in his newly -established style of karate as well as working as a medical specialist in budo injuries. Although the occupation forces banned the practice of martial arts immediately after the war, Otsuka continued teaching karate, since his club, like many others, operated under the disguise of offering boxing instructions. In the early postwar years, wado-kai got its first permanent home, a hombu dojo in front of the Tsukiji Police Station in downtown Tokyo. It had a wooden floor large enough for 24 mats. After three years, however, Hironori Otsuka shifted his dojo headquarters to the gymnasium of the Nakano Primary School in north Tokyo where it is still situated. It has a membership of about 200 persons, and karate lessons are taught twice a week. Otsuka sometimes teaches there now, but his son Jiro is chief instructor. Today, there are some 300 wado-kai dojo in Japan, including 70 university clubs and 230 company government offices and private dojo. 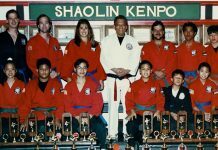 Overseas, 40 dojo are established in the United States, Canada, Brazil, Australia and other countries around the world. Hironori Otsuka has four children-two sons and two daughters. His younger son Jiro, 37, has taken over most of Otsuka’s teaching duties since the end of the war. At 5′ 8″, Jiro stands three inches taller than his father and at 155 pounds outweighs him by 35 pounds. Jiro is also a shodan in aikido. Living with his wife Toki and daughter Aiko in suburban Tokyo, Hironori Otsuka follows an amazingly busy schedule for a man who will soon hit 80. 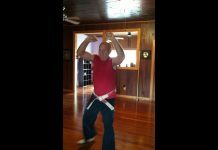 For the past 30 years it has been his custom to get up in the morning, immediately put on his karate gi and energetically practice for 20 minutes. He concentrates on only one technique a day, continuing it for a month at a time. After lunch, Hironori Otsuka takes a train into the center of the city. Twice a week he teaches karate at one of the university clubs or company dojo affiliated with wado-kai; the other four days he spends inspecting his string of dojo around Tokyo, taking care of his duties as vice chairman of the All-Japan Karate-do Federation, or pursuing his continuing study of karate techniques. He also spends time giving special demonstrations of wado-kai karate and overseeing the annual All-Japan Wado-Kai Tournament. Otsuka’s last big project is to set up an organization like the old Butokukai that would bring all of the Japanese martial arts under its wing. The new organization would not be controlled by the government like its predecessor, but would serve a similar purpose of integrating the martial arts and coordinating their activates. The nucleus would be either the Japan Classical Martial Arts Promotion Society or the Nippon Budokan Association. It’s an ambitious project for an octogenarian, but if Otsuka’s past and present health is any indication of his future well-being, he still has plenty of time to achieve such a worthwhile goal. And for an energetic and dedicated man like Hironori Otsuka, no dream is too big.